April 7th, 2015. VANCOUVER SUN Newspaper — Christian Hillier isn’t your typical entrepreneur. He probably doesn’t even think of himself as one. But that hasn’t stopped his fledgling Whistler ski tuning startup from growing into a national brand sought after by weekend warriors and professional racers alike. Hillier introduces himself as a ski coach, not a founder and CEO. He talks about the need to provide better education, not the need to drive sales and increase profit margins. And he says he runs workshops, not product demonstrations or business pitches. His company bought its first ad this winter, after 23 years in business without investing a nickel on marketing. If you Google Sidecut Tuning, Hillier’s company, you won’t find much, just his website, a Facebook page, and a few instructional YouTube videos. Despite Sidecut’s absence of marketing, the brand has quietly grown through word of mouth. Its tools are now widely considered the most trusted by everyone from technicians in tuning shops, to national team athletes around the world. To the ski racing community, Christian Hillier’s name has become synonymous with the highest quality of performance coaching. He obtained the highest certification of Canadian ski race coaching, the Canadian Ski Coaches’ Federation Level 4, the youngest Level 4 at the time and completed his elite coaching study at the University of Victoria's, National Coaching Institute. He completed 30 back-to-back winters, alternating between the Northern Hemisphere and Southern Hemisphere. In his mid-20s, he did his work experience with the Canadian alpine ski team. Later he founded the Australian ski coaching certification body, and became the Australian national team’s head coach afterwards, before coaching the Netherlands, New Zealand & British national teams. As a coach, Hillier found in Canada there was both a lack of high quality tuning tools and an understanding of how tuning impacts performance. Too often his racers would come to practices with skis that were poorly serviced or tuned with mediocre tools. Hillier figured he could merge his ski racing acumen together with his mechanical skills to create top performing tuning tools. Luckily, his father, an engineer, and two uncles owned and operated an equipment production shop. “During the night time, when nobody was around, I used to sneak into the shop and play around with the machinery,” Hillier said. The equipment production shop is where Sidecut truly started. It was his lab for experimenting with prototypes, and the race hill became an extension of that lab, with ski racers testing and giving feedback on the tools. Very quickly, race club athletes also became his first customers. They trusted Hillier as their coach and as a designer for ski tuning tools. But Hillier had another competitive edge. In races where skiers can reach speeds of 130 kilometres per hour and races can be won and lost by fractions of a second, skiers knew Hillier could teach them how to use the tools to make a difference. Hillier spent the past 15 years travelling with his teams around the world, but he kept Sidecut operations back at home in Whistler. Friends helped him with storage, packaging, and delivery. Through that time, Hillier never thought much about investing his time or money into advertising to drive more sales. He believed that providing an exceptional product in combination with the right education was the best way to run his company. 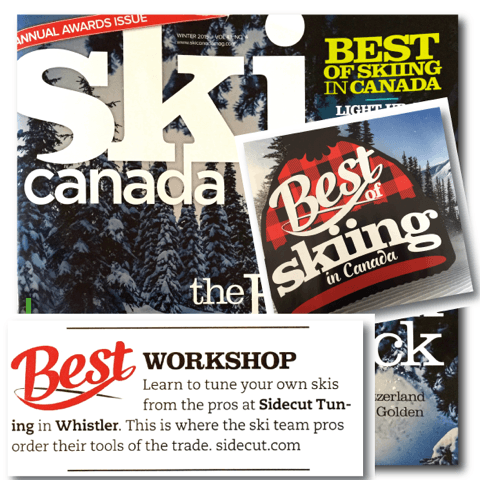 “What sets us apart could be that we're possibly the only ski tuning company out there in the world that can say that a professional ski coach not only designs, manufactures, and sells its tools, but also teaches you how to use them.” Hillier said. At the beginning of last winter, Hillier decided to take a break from ski coaching and return home to Canada. He began visiting different race clubs and retailers to run workshops on ski tuning. He also put together a series of instructional YouTube videos, called the Sidecut System, teaching people how to use Sidecut tools to tune their skis in a four part series that totals 15 minutes. “People loved the workshops and videos. Within the last 20 months, Sidecut sales tripled, and YouTube videos hit 10,000 views in only a few months,” he said. Hillier plans to continue growing Sidecut through the same formula that helped the brand grow this winter — provide education as the driver of awareness and interest. Hillier doesn’t think of himself as a genius entrepreneur. He considers himself an educator. He has made it work so that it’s all the same thing.